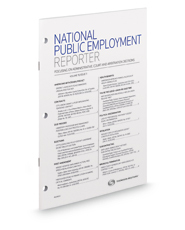 Stay abreast of administrative and judicial caselaw on public employment topics. Each monthly issue includes approximately 12 articles that summarize and discuss recent administrative, court, and arbitration decisions from across the U.S. The addition of administrative and arbitration decisions allow you to see budding trends in public employment law before the courts have an opportunity to address the issue. Covers cases from across the U.S.